Toyota Motor Corp. is aiming to triple car production in China by as soon as 2030 in a renewed push to make up lost ground in the world’s biggest market, according to sources. Asia’s largest automaker is targeting to manufacture 3.5 million vehicles annually in China around that year while boosting imports to the country to half a million vehicles, the sources said, asking not to be identified as the internal goal is private for now. Toyota can currently produce 1.16 million cars in China annually, and sold 1.3 million there last year to claim a market share of 4.5 percent. Volkswagen AG and General Motors Co. delivered more than 4 million each. The foray comes as Chinese officials warm to the hybrid technology that Toyota pioneered with the Prius, amid a realization that electric vehicles alone probably won’t be able to achieve Beijing’s ambitious environment targets, two of the people said. The government is aiming for a fifth of car sales by 2025 to be so-called new-energy vehicles, which include pure EVs and plug-in hybrids. Stringent quotas for NEV production go into force from next year. Toyota is working to correct its course in a market where VW, GM and local manufacturers such as Geely Automobile Holdings are strengthening their presence with line-ups heavily featuring plug-in vehicles. Geely, controlled by billionaire Li Shufu, overtook all its Japanese rivals to become China’s third-biggest automaker by sales this year. By contrast, Toyota had to delay the introduction of a plug-in hybrid Corolla until next year, with an EV version of its compact crossover C-HR not due until 2020. The China push is one way Toyota is adapting to fast changes in the car market — a focus on self-driving vehicles is another. On Tuesday, Toyota said it is investing $500 million more in Uber Technologies Inc. and that it plans to manufacture minivans loaded with the U.S. company’s software, with testing slated to begin on Uber’s ride-sharing network in 2021. Some of the China-made vehicles may be bound for other markets in Asia. 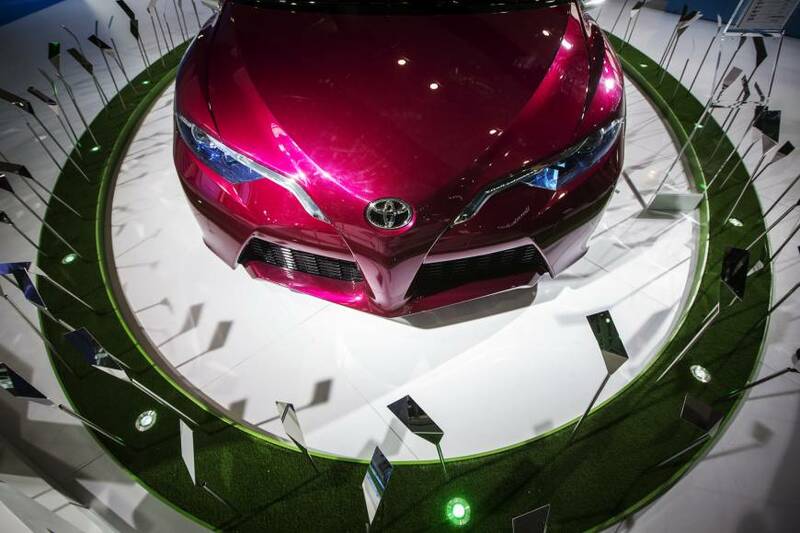 Nanfang Daily, the Guangdong provincial government’s official newspaper, cited Toyota’s top China executive as saying the country would become a hub for the company’s NEV exports to the rest of Asia. Toyota declined to confirm the comments. The company, based in Toyota, Aichi Prefecture, aims to boost Chinese capacity to 2 million vehicles annually by the early 2020s on its way to the 3.5 million-vehicle-a-year production target, two of the people said. The company plans to expand capacity in Tianjin by 120,000 units annually with local partner China FAW Group Co., according to a document posted on a local government website. The investment will total 1.76 billion yuan ($259 million), with 110,000 of the vehicles being plug-in hybrids and the remainder EVs, according to the document. Additionally, Toyota will build a new factory in Guangzhou with its other local partner, Guangzhou Automobile Group Co., capable of producing 200,000 vehicles a year, the Nikkei business newspaper reported over the weekend. The joint venture is also expanding its existing facilities to make an additional 120,000 cars, bringing annual capacity to 1.7 million units by 2021, the newspaper said. Toyota said it is studying how to reinforce its organization to accelerate its Chinese business, but declined to comment on specific moves. 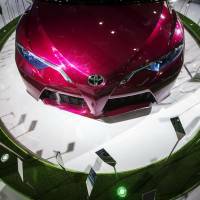 Toyota said it positions China as one of the most important countries within the global market. The plans don’t come without challenges. After years of rapid growth, the Chinese market is showing signs of cooling. Auto sales expanded just 3 percent in 2017, the slowest rate in recent years, with a similar pace forecast for the current year, according to the state-backed China Association of Automobile Manufacturers. Even so, China has been improving access to its market, slashing car import duties to 15 percent from 25 percent last month, and starting to ease rules limiting foreign ownership of joint ventures. That compares with Toyota’s biggest market, the U.S., where President Donald Trump’s administration is said to be considering tariffs on cars of as much as 25 percent, even as that market shrinks. Toyota is building a new factory in Alabama after Trump took to Twitter last year to criticize the company’s plan to make Corollas in Mexico. Toyota sold more than 2.4 million vehicles in the U.S. last year, almost twice as many as in China.